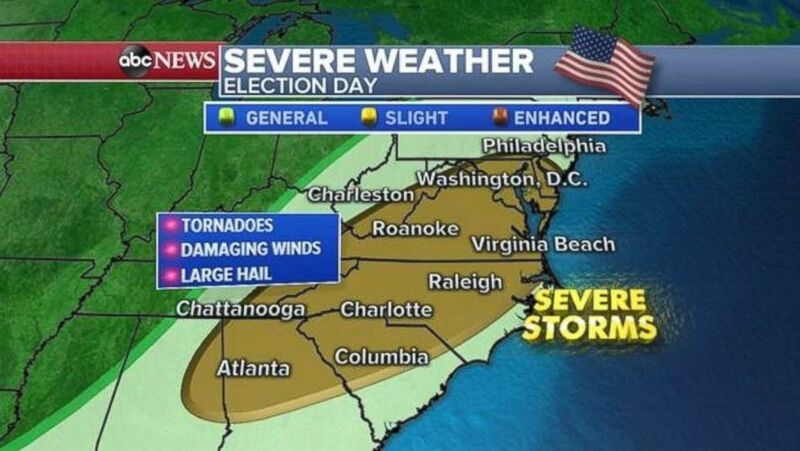 Severe weather is expected to hit parts of the country on Election Day. Add Weather as an interest to stay up to date on the latest Weather news, video, and analysis from ABC News. This next round of dangerous weather comes after an intensifying storm brought strong winds and flooding to parts of the Northeast. In Baltimore, two people died when part of an Amazon building collapsed due to a tornado with winds of 105 mph. 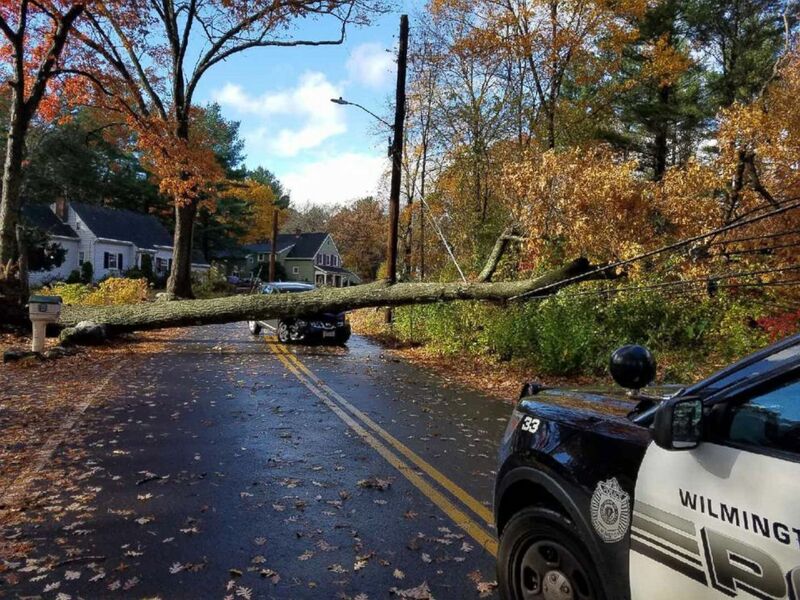 A tree fell on a car and brought down a power line in Wilmington, MA. In Boston, wind gusts approached 60 mph on Saturday. On Long Island and parts of Rhode Island and Cape Cod, there were reports of winds reaching 55 to 59 mph. 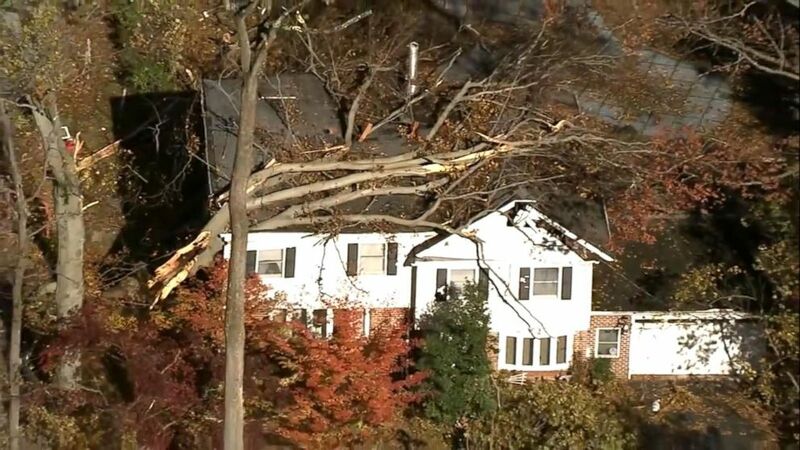 Severe weather brought down trees and power lines in the Northeast over the weekend. Several power lines were brought down as a result of the gusts in parts of Massachusetts and Maine. Thousands of power outages were reported in parts of New England as a result of the damaging winds. Additionally, there were reports of flash flooding with over 3 inches in parts of Connecticut and Massachusetts. Over 4 inches of rain was reported in Easton, Pennsylvania, as well. 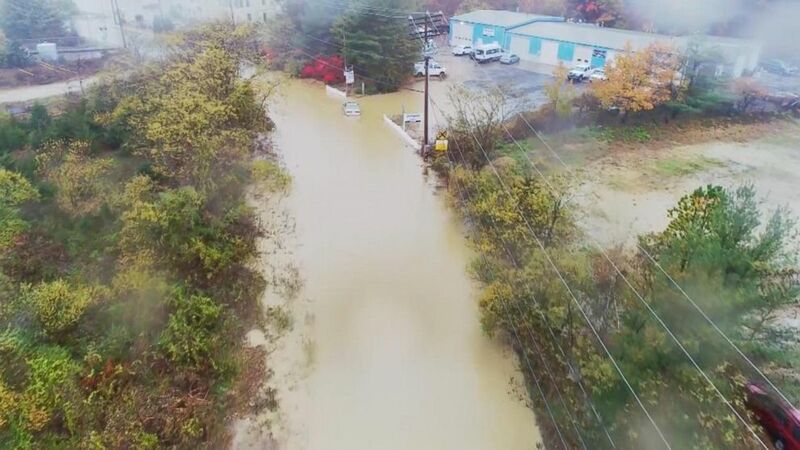 Severe storms brought flooding to parts of the mid-Atlantic over the weekend. The weather is expected to become turbulent in much of the central and eastern parts of the country in the next few days. A new storm is already developing in the central U.S. Sunday morning and will slide off quickly toward the east by Monday. This storm will bring a quick round of rain to parts of the central U.S. Sunday, and then some locally enhanced rainfall in parts of the Atlantic and Northeast on Monday. However, another storm develops immediately behind it in the central U.S. by Monday — and this storm is likely to bring a high impact weather event beginning later that night and lasting right into Election Day. Severe weather is expected ahead of Election Day. The developing storm will come out of the plains on Monday with little or no impact. However, it will very quickly move off to the Mississippi River and Tennessee Valley and likely will begin a severe weather outbreak. Late on Monday night and into early Tuesday morning, severe storms will initiate along the cold front. Conditions in the atmosphere look particularly concerning for very strong winds, and possible tornadoes. There is an increasing chance of several tornadoes on Monday night and early Tuesday morning, including the possibility of strong, long-track tornadoes. Due to the increasing confidence of a severe weather outbreak, an enhanced risk has been issued for Monday night and early Tuesday from eastern Arkansas to Southern Kentucky, including the northern parts of Mississippi and Alabama. 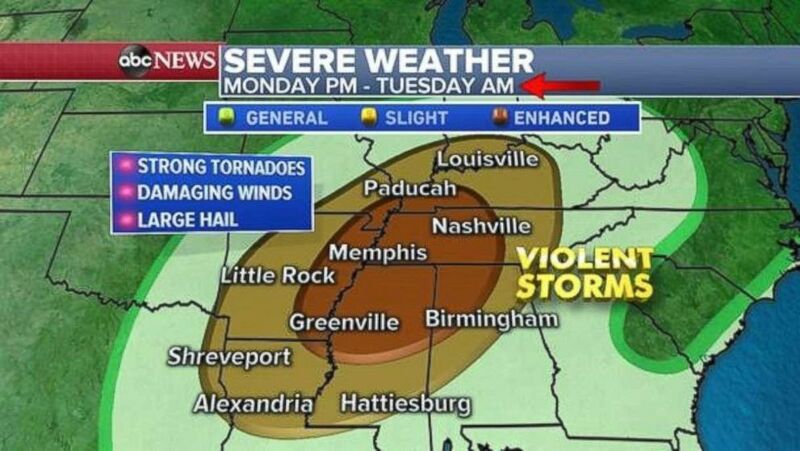 There is a chance of tornadoes in Tennessee and surrounding states. This is a very concerning situation since the severe weather will be reaching major southern cities during the overnight hours, with possibly both discrete and rain-wrapped tornadoes. 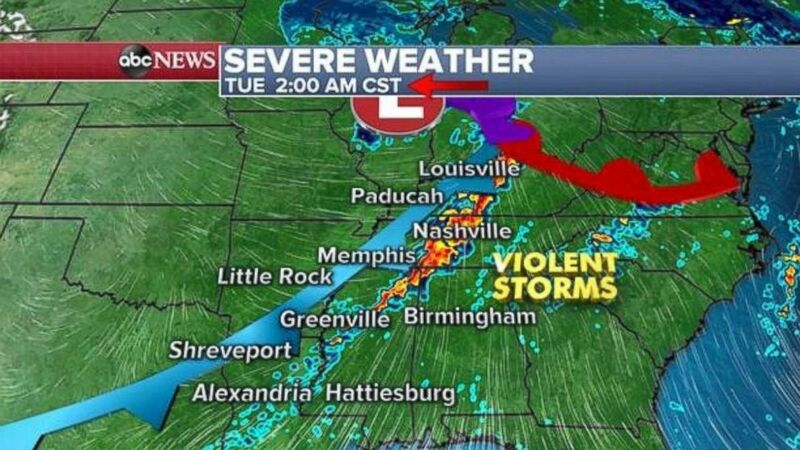 On Election Day, there will be ongoing severe weather in the early morning hours for parts of the Tennessee Valley. As the cold front slides eastward toward the East Coast, the severe threat will become somewhat less impactful. However, there is still a chance of tornadoes and damaging winds for a large part of East Coast from Atlanta to Washington, D.C. Severe weather is expected to hit the Northeast on Election Day. A slight risk has been issued for this region on Election Day. Meanwhile, heavy rains and strong storms will also move up into the Northeast on Tuesday afternoon. Localized heavy rain in parts of New England could bring some flash flooding.